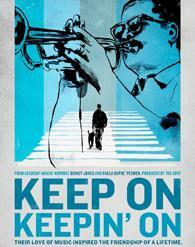 'Keep on Keepin’ On' depicts the remarkable story of 93-year-old jazz legend Clark Terry. A living monument to the Golden Era of Jazz, having played in both the Duke Ellington and Count Basie bands. He broke racial barriers on American television and mentored the likes of Miles Davis and Quincy Jones, but his most unlikely friendship is with Justin Kauflin, a 23-year old blind piano prodigy. Justin, fighting a debilitating case of stage fright, is invited to compete in a prestigious competition, while Clark’s health takes a serious turn. The two face the toughest challenges of their lives. The result is an intimate portrait of two remarkable men–a student striving against all odds and a teacher who continues to inspire through the power of music.